You have more pressing concerns than how to backup and share your data but you know it needs to be done and you know it would benefit your business. Download "You have more pressing concerns than how to backup and share your data but you know it needs to be done and you know it would benefit your business." QuickSpecs. Models. 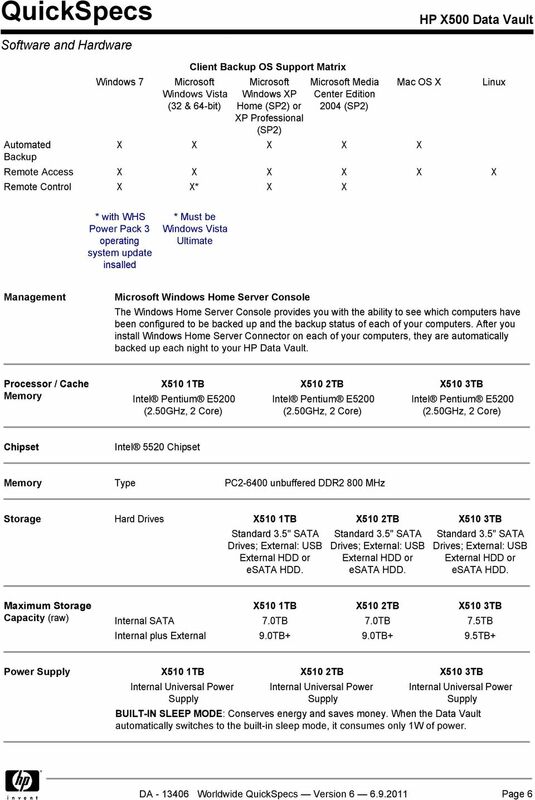 HP StorageWorks X510 3TB Data Vault. 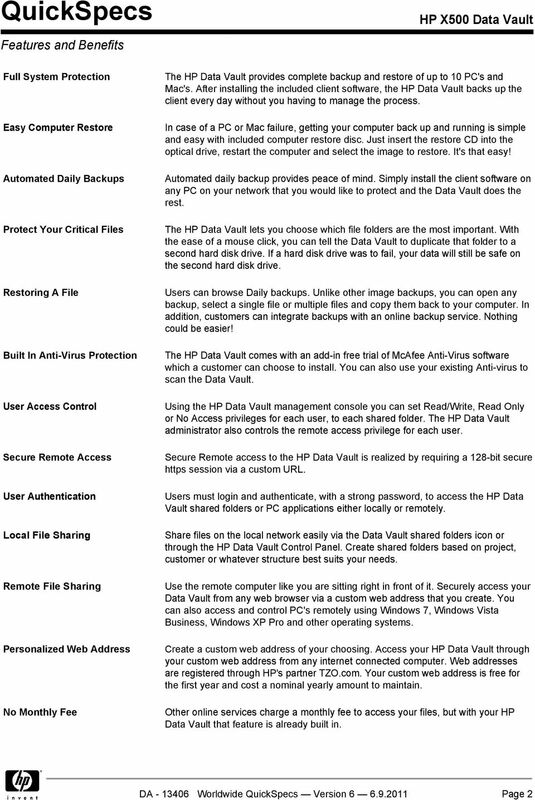 HP StorageWorks X500 Data Vault. 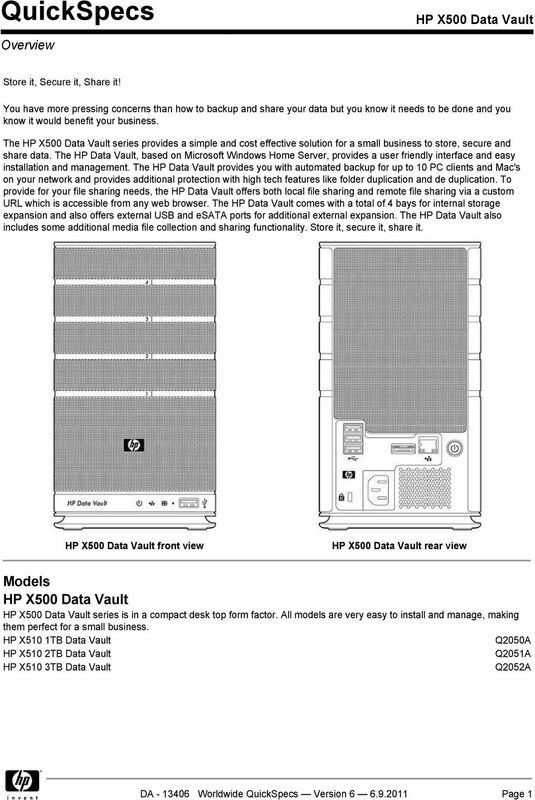 HP StorageWorks X500 Data Vault. THE. solution. STORe it. SHARE it. The DVD-ROM drive is designed to read not only CD-ROM and CD R/RW discs but also DVD-ROM, DVD-RAM, DVD +R/RW and DVD -R/RW discs. 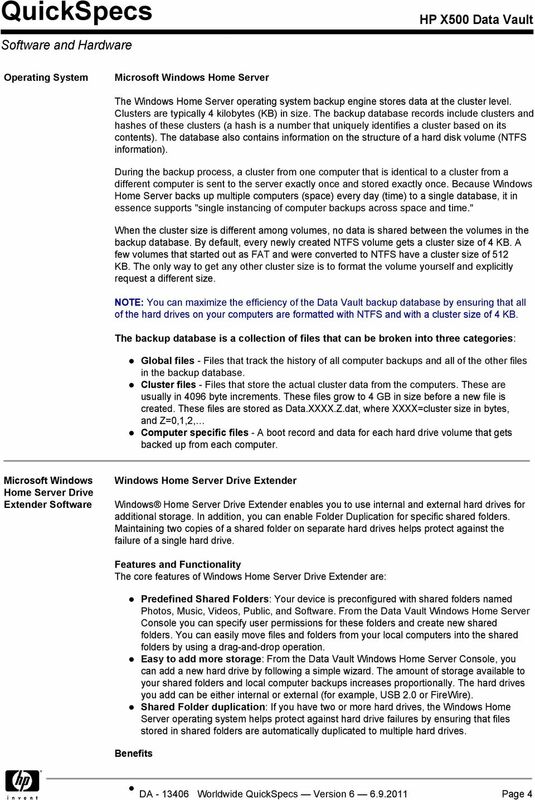 Product Guide for Windows Home Server Microsoft Corporation Published: January, 2009 Version: 1.1 This his Product Guide provides an overview of the features and functionality of Windows Home Server software. HP rack and power infrastructure products are designed and developed to be used specifically with HP servers and storage. Looking for a simple and intuitive solution that allows you to access and manage servers across your entire network? 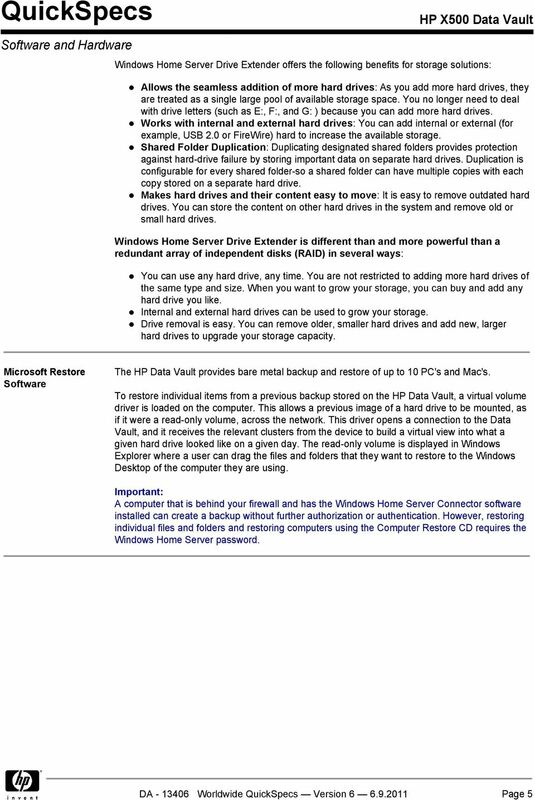 It is also available as part of the HP IS DVD and the Management DVD/HPSIM install. The DVD ROM drive is designed to read not only CD ROM and CD R/RW discs but also DVD ROM, DVD RAM, DVD +R/RW and DVD R/RW discs. 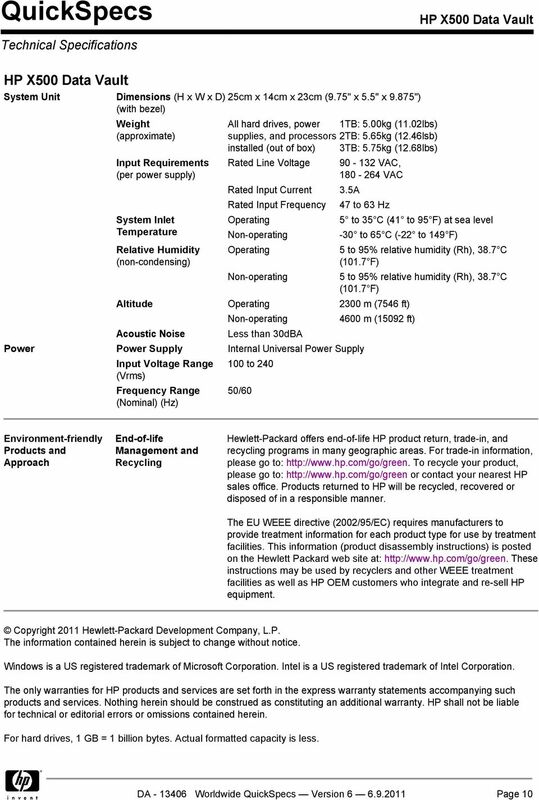 Overview HP Dynamic Smart array provides more customer choice with higher levels of data protection for embedded controllers, these data protection levels were earlier only available to standup controllers. QuickSpecs. Models HP QMH2672 16Gb Fibre Channel Host Bus Adapter 710608-B21. HP QMH2672 16Gb FC HBA for BladeSystem c-class. This user guide describes features that are common to most models. Some features may not be available on your computer.